He’s found a perfect job that combines his passions at Prospect Meadows. He’ll be involved with camps, leagues, tournaments, classes and bringing as many kids and teams to Prospect Meadows as possible. He’ll also be working to help expand the League of Dreams program, along with the Miracle League for differently-abled kids. He’ll be working with General Manager Jack Roeder, Assistant GM Steve James and the Board of Directors to help make Prospect Meadows a big success. Brecht graduated from Norway High School in 1980 and won a state championship there with Hall of Fame Coach Jim Van Scoyoc. 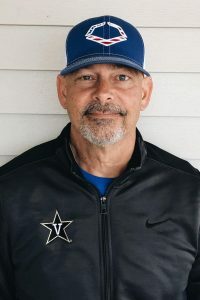 He played baseball at Vanderbilt University in the Southeastern Conference for two years and helped coach the Commodores after getting his undergraduate and graduate degrees in education. He’s also been involved with coaching in Eastern Iowa, most recently at Center Point-Urbana High School where all five of his children went to school. His daughter, Olivia, the youngest of the Brechts’ five children, is currently a freshman infielder on the Wartburg College softball team and Tim spent about 10 years as a coach with her travel teams. Brecht retired from full-time work after 20 years in pharmaceutical sales. His job at Prospect Meadows is technically part-time, but he plans to pour his energy into the assignment in a major way. Brecht sees sports as a metaphor for life, offering important lessons for kids as they grow and mature. “I really believe in that,” he said. “I grew up that way and I believe in it. This is an opportunity to get these kids out here to play ball. Brecht has six grand-children, ages 9 to 1, and some of them may find themselves playing ball at Prospect Meadows as time goes by. Brecht knows there are many facilities for baseball and softball in Eastern Iowa, but he’s confident Prospect Meadows will quickly develop into a hub for top-flight competition in youth baseball and softball. “You had to go to Kansas City and Des Moines and Omaha and St. Louis and the Quad Cities for good competitive play,” he said. “This kind of thing wasn’t around.